Fosway Vendor Reports provide unbiased insights into the Next Generation HR and Learning solutions. They are the only in-depth, independent analysis aimed at supporting corporate decisions for organisation based or operating in Europe. We know how expensive and time consuming research can be. To help with your procurement process or to help you review your current vendors, we have created our Vendor Reports. These review the solutions available from the key players across the Next Generation HR and Learning markets. 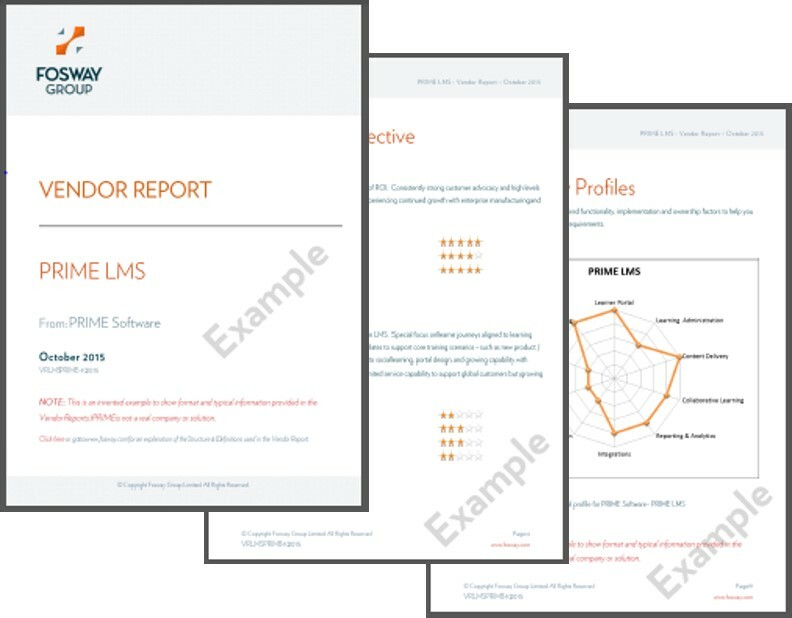 So now when you’re evaluating HR or Learning Technology solutions, you have the benefit of these unique reports as a short-cut to expert insights, analysis and inside information that will help you eliminate risk and make the right decisions. The Fosway team of analysts independently uncover all the key elements that HR and Learning practitioners need to know to support organisational decision making and strategy. Vendor Reports build on the research conducted for our 9-Grid™ market analysis, providing deeper analysis and assessment of solutions based on key criteria including in-depth customer feedback. They are your must have guides to making an informed choice about your technology procurement. Anyone involved in implementing HR technology solutions should use the Vendor Reports to get an independent and instant insight into the solutions that exist in the market today. Understand suppliers’ scalability to deliver and customer success: Fosway Vendor Reports provide analysis and critical insights across a range of key themes, from their market and customer performance, scope of solution and sophistication, market presence, EMEA track record, and total cost of ownership. Understand solution’s functional capabilities: Vendor Reports also provide independent, functional analysis of solutions across the key functional areas associated with that solution type to help you to understand the functional richness of the solution. Each Vendor Report is 10+ pages long and covers the most important information you need to know up front. Each factor (core and functional) in the assessment is rated on a one to five star rating system, and each group of factors includes key headlines to guide on particular strengths, weaknesses, or risks. Performance How does the solution perform in the market and in real customers? How often are they shortlisted in procurement processes, how often do they win, do the deliver, and are customers happy? Potential What is the potential for the solution to meet or exceed the needs of customers, including scope and sophistication of the solution? Presence What is their presence in the market place, both in terms of scale and maturity of presence? How influential are they in the market overall? What is the real cost of the solution, including: cost to acquire, cost to implement, cost to operate & maintain, and cost to innovate. A unique feature of the Fosway 9-Grid™ analysis model. Where is it potentially trending in terms of the 9-Grid™ analysis? How is it changing relative to itself and the market as a whole in terms of performance and potential? For more information on the Structure and Definitions in the Vendor Reports please click here.